The first-ever Palestinian embassy in Western Europe has opened in Sweden on Tuesday evening, the Swedish prime minister’s press service said. President Mahmoud Abbas has arrived in Stockholm for the event. "Your recognition...should push forward negotiations in the peace process," Abbas said. Prime Minister Lofven has vowed aid to Palestine, but has also called on reforms. "There are challenges: we must help one another to fight corruption, increase gender equality, improve respect for human rights, and of course continue the state building process," Lofven said. Under the newly signed deal, Sweden’s financial help to Palestine will grow by 1.5 billion kronas (US$179.74 million) over the next five years. Palestine has diplomatic missions in countries that either recognize or partially recognize it as an independent state. Until Tuesday, Palestine had a General Delegation of Palestine in Sweden, based in Stockholm. 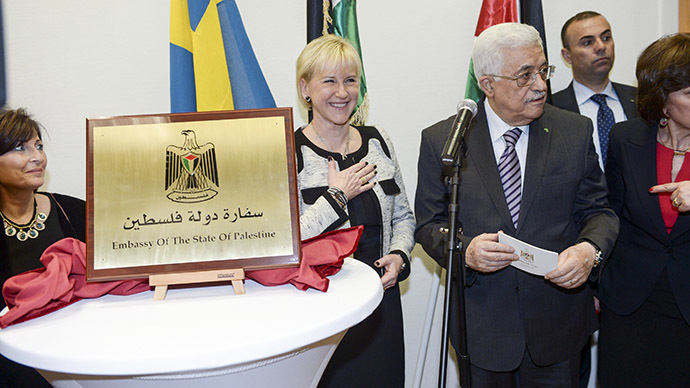 On October 30, Sweden was the first Western EU member (and 135th of the world's 193 nations) to officially recognize Palestinian statehood. Britain, France, Spain and Portugal followed suit. The plan to recognize Palestine was criticized by Israeli Foreign Minister Avigdor Lieberman, who said that Prime Minister Lofven “must understand that neither declaration nor move by an external player will replace direct talks between the sides that will be part of a comprehensive accord between Israel and the entire Arab world." Following the move, relations between Sweden and Israel soured, and deteriorated even further early this year, when Foreign Minister Margot Wallstrom called off a visit to Israel in January. At the time, Israeli media cited Lieberman as saying that he did not want to meet Wallstrom, and that she wasn’t welcome on an official visit to Tel Aviv. Late last year, the European Parliament also voted to recognize a Palestinian state in principle, with a total of 498 MEPs voting in favor. On December 30, an official bid for Palestinian statehood was submitted to the UN Security Council. However, the UNSC failed to adopt the Arab coalition’s bid for the creation of a Palestinian state. A total of 135 countries recognize Palestine – including several Eastern European nations, which did so before joining the EU. The Palestinian ambassador to Russia has praised Sweden for taking a “huge step” towards Palestine’s broader recognition in Europe. “This is very important to us and we hope this trend to recognize Palestine as a state continues in Europe and that other countries within the EU will also recognize us. Sweden made a huge step in that direction," Fayed Mustafa told Sputnik.